Art is my spiritual practice. As I connect to deeper levels of intimacy with soul, my paintings spontaneously arise. I trust the Process. Art is a miraculous gift that provides direct access to the complex and vast feminine psyche. Through Intuition as my guide, I dance with the great Mystery. It is a love affair that expresses itself through color, movement, shapes and form in a magnificent unfolding on the canvas. Creating Beauty is a doorway to healing. Serving Beauty through art is my life work. Sharing the remembrance of Beauty with others is my Joy. Painting is a perfect mirror that reflects us to ourselves and allows us to connect with our truth. I am inspired by the triumphant human spirit. My art is dedicated to the path of the heart, and the vision of global peace. I believe we go through cycles of death and rebirth within our soul, and creativity is a spiritual tool for healing, on a personal and collective level. Art is an energy that requires freedom, movement and Attention to what is present. When we remain uncluttered and create space, beauty and peace have room to enter. Painting a celebration of life with feminine imagery at the center of it all. ‘Woman’ is a universal symbol of life generation; I often use eggs to represent new life and possibility, and wings to inspire freedom and triumph. I like to paint the intimate moment when a woman has just encountered sacred insights, and she knows it; I think of each painting as a ‘blessing priestess’ which carries a specific healing. Transmitting deep wisdom, fierce determination, and devotional love, I am empowered by my own instincts and integrity. I am fascinated by the space between the physical world and the mysterious spirit realm. I describe this spacious quality of spirit in my art through soft, undefined places or the contemplative gaze. Mystery is the source through which gifts of intuition, instinct, and wisdom are given. My art reflects a woman’s journey into the psyche to honor what is dying, to retrieve lost aspects she has abandoned, and to make room for the emergence of greater divine force to move through her. It honors the courage required to create new life based on new consciousness. It is the heroine’s journey. The canvas captures a conversation of ‘soul talk’, speaking a language of its own. I listen intently to the whispered messages, recording what I hear by layering color and shapes, producing transparent effects, and by allowing organic beauty to emerge. The image becomes a translation of symbolism embedded with healing energy. Painting from this deep source of inspiration is available to everyone. I offer classes that teach women how to access the powerful realm of Intuition and Wisdom through my approach of “Allowing”. Leading transformational painting journeys is my Soul’s work …My hope is that my art and teaching function as a mirror for other souls to find refuge, inspiration and empowerment for their own soul journey. Flora combines 15 years of painting experience with an M.A. 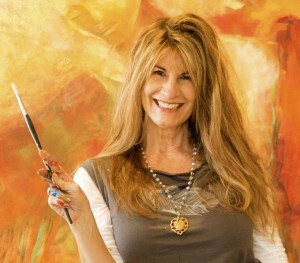 in Counseling Psychology, bodywork therapy, work as an education director, and seminar leader to infuse her teaching and painting style with a deep connection to mind, body, and spirit. In 2014 Flora founded the ‘Art of Allowing Academy’, an Intuitive-based painting approach which empowers students to create from the intelligence of their own inner Guidance. Flora’s art is in collections around the world, and been featured for Awakening Women Institute, Treesisters.org, and licensed by Blue Angel Publishing.